Summer in the air! I spent Mother’s day outside drawing all over the sidewalk with chalk with my son and just relishing that I didn’t have to be in the kitchen. When we came inside and I pulled these from the freezer and my son and I literally sat down and ate the entire batch in an hour. 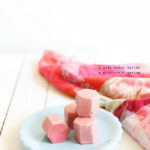 After my first bite of these Strawberry ice cream bon bons, all I could think of was that I was eating frozen Starburst candies. The Little loved them. Seriously it’s amazing how fast a 2 1/2 year-old can shovel down a dish when he’s so inclined. Even now when he’s Cartwheeling past the screen he keeps pointing at the computer and asking to eat this. This is so simple and I am going to have to admit that I’ve become a huge fan of the freeze dried fruits so expect to see more recipes with using them. I hope you enjoy it! 2/3 cup coconut oil melted. 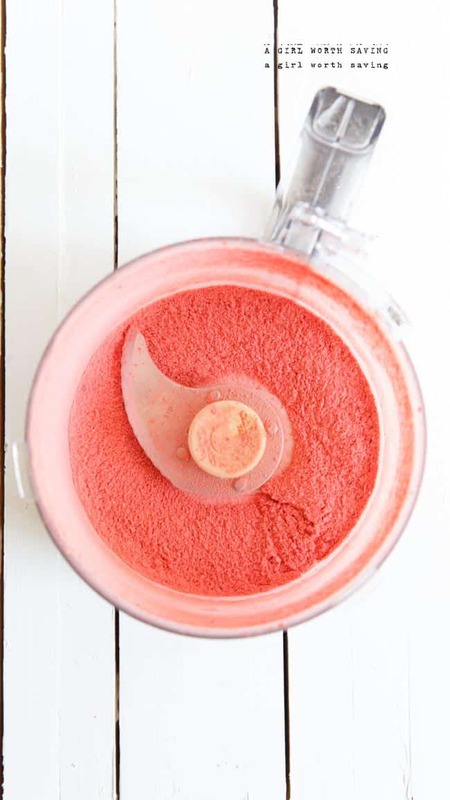 In your food processor add the freeze dried strawberries and pulse until completely crushed. Then add in the melted coconut oil and banana chunks and pulse until smooth. 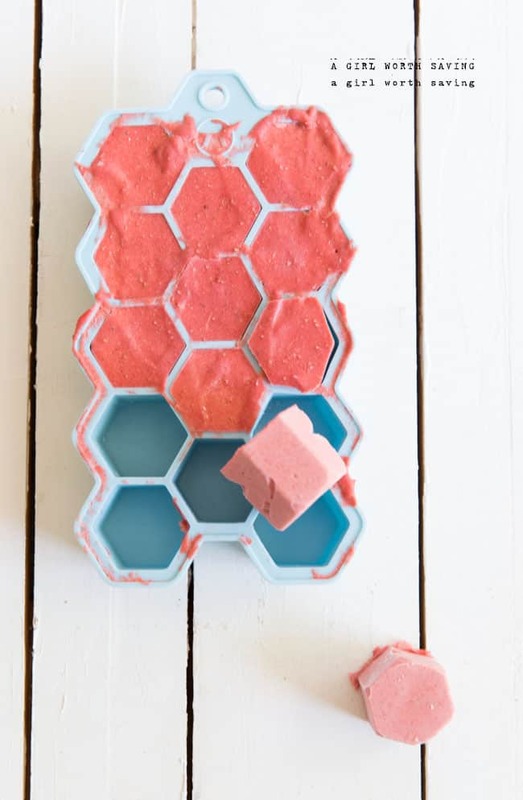 Pour the mixture into a silicone ice cube tray and freeze for 4 hours. Remove and try not to eat them all in one sitting. These look so good Kelly! I am going to make them today. Can’t wait for your new book! 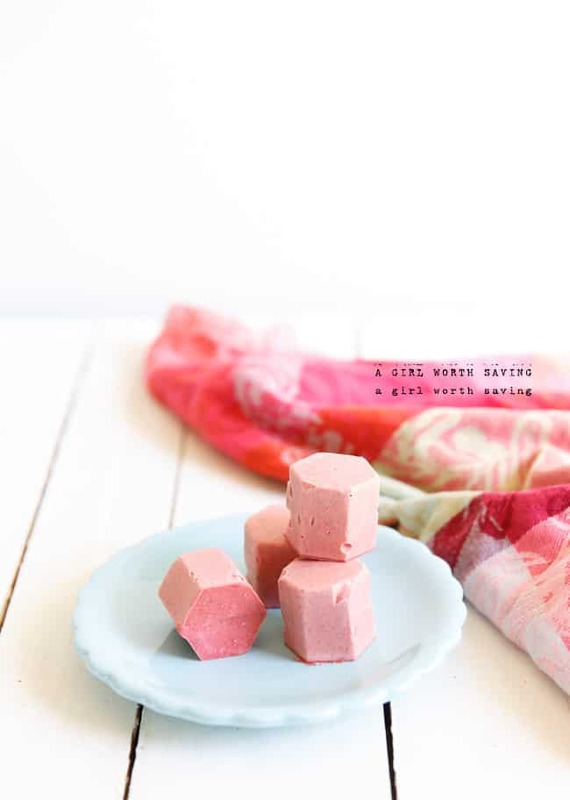 Freeze dried strawberries? Can I use just frozen berries? If so, are there any adaptations to the recipe? Thanks! HUn, freeze dried strawberries are dehydrated so they add a lot of flavor and none of the liquid which will change the recipe. You can try with frozen berries and it should come out well since it’s frozen but the constancy will be different.